The dire wolf was a prehistoric animal that lived primarily in North America. A simulated image of the extinct dire wolf. The dire wolf (Canis dirus) is an extinct species of wolf that lived in the Americas. It inhabited the plains, grasslands, and forests of the United States, from Florida to Alaska, as well as the savannah grasslands of South America. The species became extinct approximately 10,000 years ago, after the last Ice Age. The majority of dire wolf remains were found in the La Brea Tar Pits, near Los Angeles, California. Dire wolves lived in both popular lore and pop culture, as evidenced in the HBO series Game of Thrones, and were adopted as pups in the first episode of the series. After the Ice Age, climatic conditions led to the extinction of the dire wolf through the process of natural selection. Dire wolves mated once in a year, usually between January and March. Due to the large size of packs, dire wolves were mainly monogamous and alpha males would mate with beta females upon reaching maturity at two years of age. Females would carry pups for two and a half months, after which they would set up isolated dens to give birth. Mothers fed pups for at least one month before letting them out of the den. Pups were not allowed to join the pack during hunting expeditions, and would stay in rendezvous zones awaiting prey from their mothers until they were at least one year old. 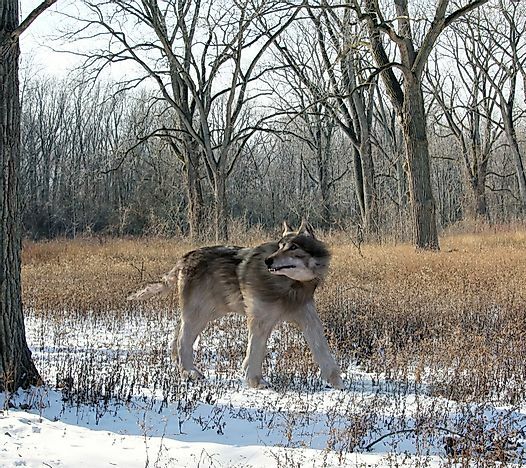 Dire wolves were renowned large pack animals that lived and hunted in packs. Despite their aggressive nature, dire wolves were very loyal animals to their masters. Fossils of the animal indicate that wounded and injured members of the pack were fed by healthy members. Due to their caring nature, dire wolves were hunted and domesticated as a sign of prestige and security by their masters. Moreover, like other carnivorous pack animals, the stronger male species were dominant in the group, as seen in some skulls where jaws of another speculated stronger dire wolf were found. Dire wolves inhabited the plains, grasslands, and rainforests of North America and semi-arid areas of South America. The location of their remains shows that dire wolves predominantly lived in the open lowlands, from sea level to elevations of 7,400 ft. Unlike its close relative, the gray wolf, the dire wolf was adapted to low altitude areas where prey were in abundance. After the Ice Age, warmer climatic conditions made it difficult for dire wolves to survive in their habitats, gradually eliminating them from the ecosystem through natural selection. Wild and domesticated dire wolves were mainly carnivorous animals that hunted their prey during the day. Their preferred diet was composed of horses, sloths, camels, and megafauna mammoths. During harsh times, dire wolves supplemented their diet by scavenging on carcasses left behind by smilodons. The extinction of the wolf’s main diet caused them to starve to death. The dire wolf is classified as the largest canine that ever lived. Dire wolves were distinguished by their color mixture, which was mainly black and white or black and gray. They were relatively large, with strong massive canines specialized for tearing flesh. Their feet were short and hefty to support their strong body muscle that allowed them to forage on large mammals.